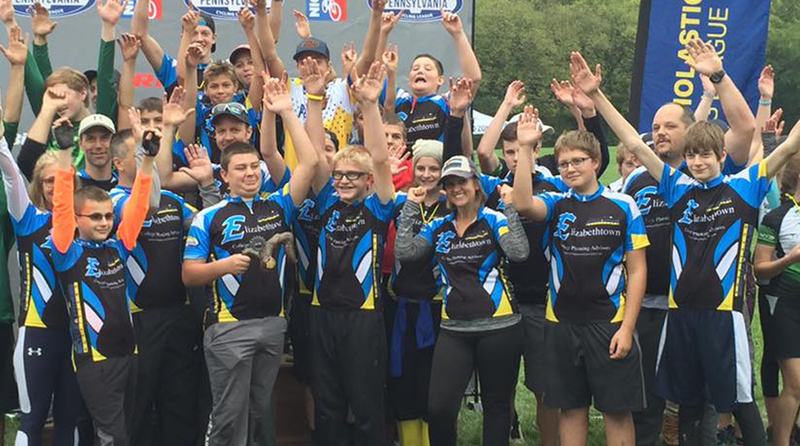 EtownMTB is an awesome team and we hope to add you to our team!! We are Elizabethtown Area Students from the High School and Middle School as well as Bear Creek sixth graders - boys and girls!! This will be the best sport you will ever participate in. If you have any questions that are not answered here come check us out at a practice and see for yourself. Where can I find dates and downloads for EtownMTB? If you are using a computer, important information including dates and downloads will be located to the right section of this page (the student page). If you are on a mobile device, that information will be at the bottom of this page. Dates will also be posted on the front of the EtownMTB website. During the season we also post important information using our team communication app (TeamSnap). Please send us an email. We check emails every day and will get back to you. How do I sign up for EtownMTB? During the signup perdiod, download the form from our download section and return it the contact info provided on the form. If you are new, read through the rest of these FAQs. Then download the form and return it to school. Do I already have to know how to ride a mountain bike? No! All skills required for learning how to ride will be taught at practices. How often is practice and where are practices held? Practices are usually held on Tuesday and Thursday evenings from 6:00-8:00. At the beginning of the season all practices were held at the Fairgrounds. Once coaches feel students will be safe on trails, trails rides are arranged for Wednesdays and some Saturdays. Once we know how many students there are for the season, we will create a schedule and communicate it to our student athletes. Where will practices be in 2019? We anticipate a similar schedule. However, we are currently evaluating options based on a number of factors and will update this once information becomes available. Can I be involved in this club as well as sports or band or other activities at school? Absolutely! Most of our athletes are involved in a variety of other activities. There will be a skills boot camp clinic held in the beginning of July that all riders are required to attend. Consider this a skills boot camp to quickly get you going. Don't get worried - it's a ton of fun!! At this camp, our head coach will outline the practice schedule. And we will put that information on the website as well. Do I have to participate in races? While we would love to have everyone try out at least one race, we understand that not everyone has that desire to race (but once you try one we think you will be hooked!). If you don't want to race but still want to experience the team race environment, come along with a friend and cheer on your teammates. How do I know if my bike fits me? With the help of the coaches and our local bicycle shop, we will make recommendations to make sure your bike fits you properly. There is a bike check date that we require our students to bring their bikes in for this purpose. Besides having a properly fitted bike, you will need a properly fitted helmet (which is a requirement for all riders) as well as filled water bottles at each practice and bikes tubes if the bike is not tubeless. Other equipment that is really recommended is a good pair of padded bike shorts. And lastly, it would be nice to have biking gloves and sunglasses but it's not necessary. If you need help with getting a pair of biking shorts, visit the local bike shop. Why are there so many coaches? EtownMTB has one head coach - Jason Thomas. And a lot of assistant coaches. We want to make sure that we can accommodate all students who want to participate and we want to make sure we can do it as safe as possible. All coaches have a strong lifelong relationshop with their own bikes and they want to make sure EtownMTB kids develop that same love. When do we start riding trails? All EtownMTB riders will be constantly assessed on their skills to make sure they have everything they need to before riding any trails. We want this to be a fun experience but also a safe one. In 2019 there will be six sanctioned season races that span from August to October. Additionally, there will be adventure rides for the kids who do not want to race. Races are held across the state of PA as well as right across the border in MD. When a racer completes a race, they earns points for their individual standings. At each race event, racers add to their standings to determine who the season winner is. I'm in 7th grade? Who do I race against? Is this an individual sport or a team sport? Both! As mentioned above, each rider accumulates points for his/her own standings. And teams earn points as well! Is there a podium finish? Yes! This is part of the race experience just like you would see at the Tour de France. Racers earn spots on the podium for each race and teams also earn podium spots for how well the combined team did. After each race all teams "race" to take down the course, equipments, tents, etc and then we gather around the podium station. We are pretty confident that EtownMTB will have racers on the podium each race and we encourage all racers to stay until the end when the team finishes are announced. Is EtownMTB part of the PIAA? No. EtownMTB is considered a racing club. We are part of the The Pennsylvania Interscholastic Cycling League which is a non-profit 501(c)3 NICA Project League. What is that TeamSnap link on this page? TeamSnap is how the team communicates. Once you are on the team you will be invited by the coach to join the site. You can either download the app onto a smartphone or use the logon on this site to access your account. We use this to let coach know if we are going to be at practices or trail rides (so he can plan numbers - always thinking about safety). We also use this to let coach know if we plan on racing at a certain race. And new for 2017 will be the ability for parents to sign up for snacks and other various team volunteer opportunities at races. I've decided to race during the season. Now what? What do I need to know as well as my parents? We are excited that you want to race. The Race Day Preparations Page will lead you to a page that is devoted to getting ready for races. You will find information about nutrition, hydration, race registrations, what you should bring to a race, info about what happens on the day of a race as well as information for parents. It's loaded with information. But, if you still have questions when you are done - please feel free to ask a coach. July 1,2,3,5: Skills Camp; Normal weekly practices start the following week. Aug 23-25 PICL Adventure Weekend and IIGO Fundraiser! Part of being a responsible rider is to participate in maintaining our trails. Our students from EtownMTB along with coaches and parents and other community volunteers will work together to do some maintenance on our trails. Every student athlete contributes time to trail creation and maintenance. Copyright © 2019 HMHApps All rights reserved.